Yes, heroes do still exist — and they’re dedicating themselves to saving lives and curbing crime in La Mesa. 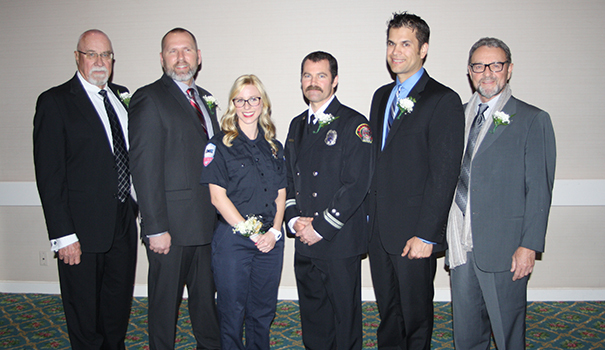 A paramedic, firefighter, two police detectives and two retired police patrolmen were honored at the 9th annual “Salute to Local Heroes” event hosted by the La Mesa Chamber of Commerce at the Town and Country Resort in Mission Valley on Feb. 22. “We are proud to honor these local heroes for their various heroic actions and the results on their activities that have a major impact on our community and the region,” said Chamber president and CEO Mary England. The event served as both celebration and fundraiser, with 25 percent of the silent auction proceeds going to the La Mesa Police Department Wellness Peer Support Program, and other proceeds benefitting Chamber annual projects. Each hero was nominated from within their own department. They were treated to the Salute dinner and showered with flowers, certificates of honor and other gifts. A young man owes his life to one of the heroes, Elizabeth “Liz” Robinson, who is a paramedic with American Medical Response San Diego. She works the East County unit serving San Miguel, Lemon Grove and La Mesa, and was the paramedic on the scene of an automotive vehicle versus a pedestrian accident on May 23, 2016. A 23-year-old had been struck by a car while crossing the street. The impact threw him onto the vehicle’s hood, the windshield, and then onto the street. He was found lying next to the vehicle, conscious but not lucid. Robinson and her partner were there within three minutes and both on the ground and in transport life-saving measures had to be performed. The patient was medically paralyzed at the hospital and placed on a breathing machine. He was diagnosed with multiple spinal fractures and a closed-head injury. The man was eventually brought out of the medically-induced coma and after several days in the hospital, discharged to his home for further recovery. Part of his eventual recovery is due to the care he received before he ever got to the hospital. It takes bravery to face a life and death situation with a cool head. It also takes bravery to take on two of the most dangerous gangs in San Diego County. That’s what Det. Jacob “Colt” Wisler of the La Mesa Police Department was honored as a hero for. He led the East County Regional Gang Task Force, which coordinated with six other law enforcement agencies and the District Attorney’s Office. Wisler participated in and coordinated multiple 24-hour surveillance operations and was the first La Mesa police detective to be the affiant in a gang-homicide wiretap investigation. The result of the task force’s work was to serve nine search-and-arrest warrants in San Diego, Humboldt County, Las Vegas, and Phoenix. Those warrants ended in three suspects being arrested for murder; two gang members arrested for narcotic sales; three firearms confiscated; more than six pounds of marijuana; and several thousand dollars seized, along with numerous cell phones, computers, and financial documents. Another detective, Tim Cook, was also honored as a local hero. On top of his work closing auto theft cases, working details and hosting trainings at La Mesa Police Department, he has also been a crucial part of the Regional Auto Theft Taskforce (RATT) and Operation Kwik Boost. Launched in January 2016, the operation was to utilize a “storefront” location, with undercover detectives in RATT and Alcohol, Tobacco and Firearms departments purchasing stolen vehicles, narcotics, and illegal firearms. The goal of Operation Kwik Boost, which was based in East County, was to identify, infiltrate and dismantle criminal organizations throughout San Diego County. Cook was instrumental in getting the operation off the ground by managing personnel, identifying multiple locations, and still maintaining safety for those involved. The operation was so successful, that at the early stages, RATT actually ran out of room for recovered vehicles, so Cook helped secure parking lots to temporarily store these vehicles. The operation also led to the recovery of 51 firearms, three kilos of cocaine, five and a half pounds of methamphetamine, 15 pounds of marijuana, and 86 arrests. Cook created the spreadsheets to track the cases, evidence, vehicles and victim/witness lists. He also coordinated the takedown involving more than 200 law enforcement officers and agents. Mike Sparks and Bill Walton are part of the Retired Senior Volunteer Patrol (RSVP) program and have stepped up their efforts with the retirement of the volunteer coordinator. Sparks works two days a week in patrol and has volunteered for many other duties including Kidz Watch Academy and as a trainer for new RSVP members. Walton volunteers three to four times a week and has taken on the responsibility of updating the RSVP manual. He also maintains several monthly reports and schedules. Their nominations spoke of both of their willing attitude and dedication to the Patrol. Rounding out the heroes honored was Heartland Fire and Rescue La Mesa Fire Captain William “Billy” Doig, who was also named the 2016 Fire Department Employee of the Year. Doig has been serving the residents of La Mesa since 2004, and still receives visits from a girl he helped deliver while he was a relatively new firefighter. He was promoted to Fire Captain in January 2016. His nominees called him a “true champion” of the community. Doig coordinates the La Mesa Firefighters Pancake Breakfast, La Mesa Fill the Boot Drive, leads the La Mesa team in the annual 9/11 Memorial Stair Climb, and helps raise awareness for the Burn Institute, on top of his captain duties. Doig and his fellow honorees help represent what makes La Mesa a true “jewel of the hills” — people with a selfless heart and willingness to serve those around them despite personal sacrifice.